It was a cold and rainy day in March. I went to Kristoff’s where I usually get my hair done but Kristoff wasn’t there. He had mysteriously disappeared. In his place was a stranger named Rinaldo. I’ll never forget him. His eyes were steely gray. His hands were like ice. He said, “I’ll streak your hair and I’ll give you a body wave.” He worked very fast and then, as he turned my chair around to face the mirror, I saw it. He permed me! NOOOOOOOO!!!! I know, I know…the horror, right? This little anecdote is from one of the best summer movies ever (high praise, but completely warranted): Troop Beverly Hills. It follows the wilderness-incompetent Troop Beverly Hills as they try to earn patches and sell cookies to make it to the jamboree. The villains are the deliciously titled Culver City Red Feathers. And, there are fashion shows, a young Jenny Lewis, and old school Craig T. Nelson rocking the OG dad bod. Too good. But the best part of the movie has to be Shelly Long’s hysterical performance as Phyllis Nefler. Between her cigarette holder and designer khaki uniform, she’s like if Patton stumbled into Dynasty. Her indefatigable optimism pushes the troop past every obstacle, always in style. I recently invited Lauren, the girls of Team LC and some of our gal pals over to have a girl’s wine night and screening of this fabulous film. 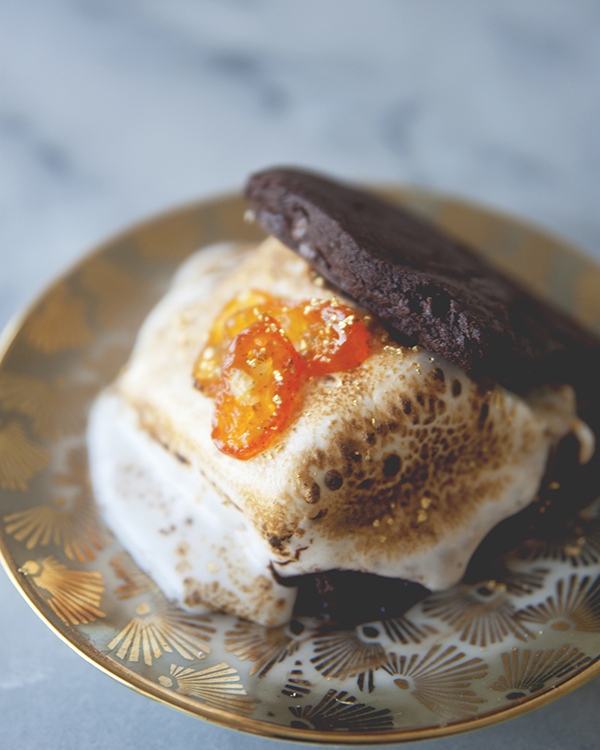 And after taking a walk down memory lane that night, I was so inspired by the blend of scouting and shopping that I created a Troop Beverly Hills S’more: Champagne marshmallows, chocolate sables, candied kumquats, and obviously, GOLD. These are decadent, and more appropriate in the Polo Lounge than the great outdoors, but still so fun. Enjoy! Oil bottom and sides of a 9×13 inch rectangular metal baking pan and heavily dust the bottom and sides with some powdered sugar. In the bowl of a standing electric mixer, pour in a ½ cup hot water and sprinkle with the gelatin. Let it stand for about 10 minutes. In a medium heavy saucepan combine the white sugar, corn syrup, and remaining hot water over medium heat, stirring with a wooden spoon, until sugar is dissolved. Bring the mixture to a boil and cook, without stirring, until a candy or digital thermometer registers 240 degrees, after about 12 minutes. A word to the wise, this happens very very quickly. While I turned around to tidy up, the entire batch jumped to 275 and burned, so once the thermometer reads 200, keep a close watch, and take it off the heat when it reaches 238. The thermometer should still creep up to 240 after that. Remove the pan from heat and pour sugar mixture over gelatin mixture, stirring until gelatin is dissolved. With the whisk attachment, beat the mixture on high speed until pale white, thick and nearly tripled in volume, about 6 minutes if using standing mixer. In a large bowl separately beat the egg whites until they just hold stiff peaks. Add the whites and Champagne into the sugar mixture until it is just combined (about 2 minutes). Pour the mixture into the prepared baking pan and garnish with the above ingredients (or sift a thin layer of powdered sugar) evenly over top. Let the marshmallow set uncovered, until firm, at least three hours, and up to 1 day. Run a thin knife around edges of pan and invert pan onto large cutting board. Lifting up 1 corner of inverted pan, with fingers loosen marshmallow and let drop onto cutting board. With a large knife trim edges of marshmallow and cut marshmallows into roughly 1-inch cubes. Sift remaining powdered sugar into a large bowl and add marshmallows in batches, tossing to evenly coat. Marshmallows keep in an airtight container for up to 1 week. Boil together until syrupy. Pour off and seal. Roll out the dough ½ inch thick on a lightly floured work surface into a 6×7-inch rectangle. Using a ruler, square the edges as much as possible. Using a sharp knife or a pizza cutter, cut the dough into 1 ½ inch squares. Place them 2 inches apart on a parchment-lined baking sheet. Bake for 15 minutes and cool completely on a rack. 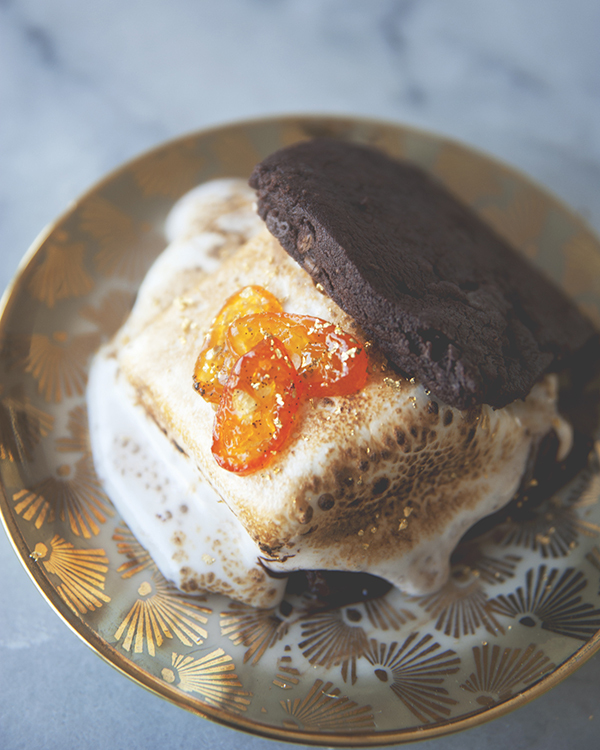 Build the s’more and sprinkle with gold leaf, then add a dollop of kumquat jam to finish it off. Enjoy! And there you have it! 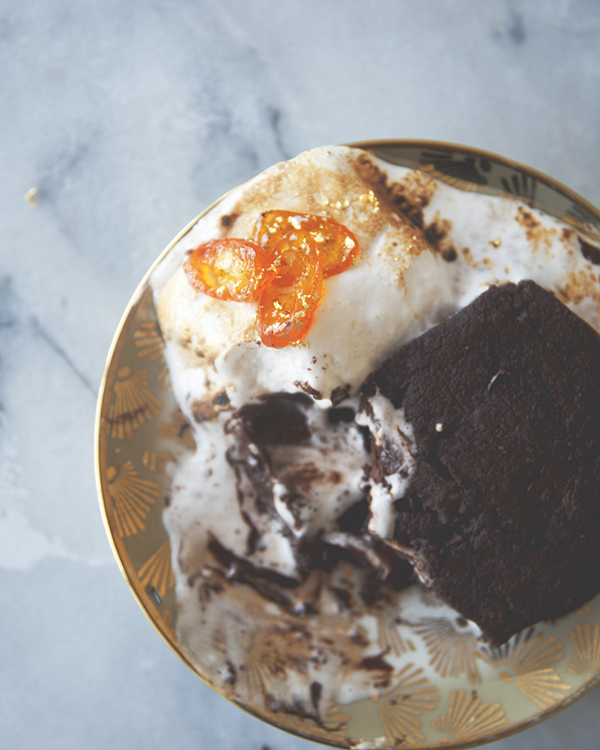 These desserts are as decadent as they are photogenic, in my opinion. Which movie would you like to see me create my next recipe from? Let me know in the comments below. And stay tuned for a fun Fourth of July cocktail recipe coming next month!